CYA Rentals Ltd. is committed to ensuring that practical and effective measures are in place to protect the health and safety of our contractors, clients, suppliers, the environment and the public areas of our operations. 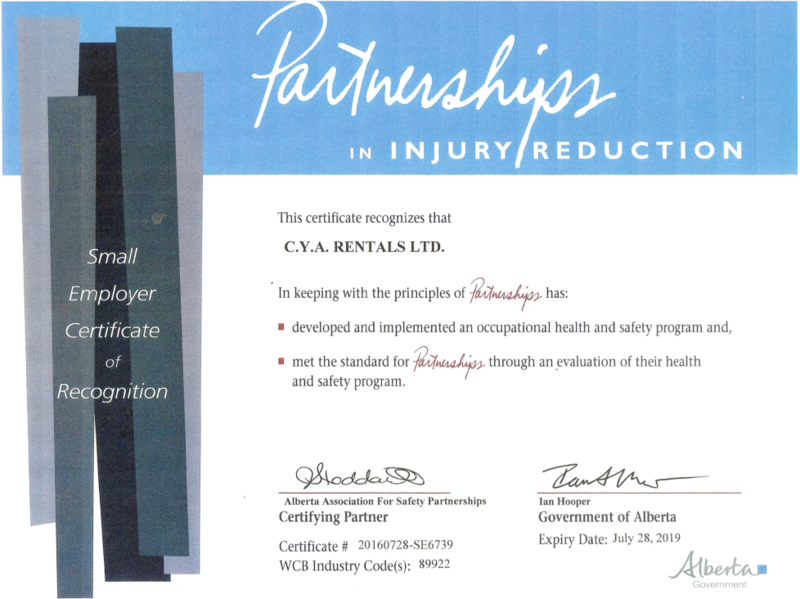 The management of CYA Rentals Ltd. will endeavor to provide and maintain a safe work environment and requires that its’ personnel, clients, contractors and suppliers plan and design safety into each of their operations. CYA Rentals Ltd. management and contractors are aware of, and comply with, all relevant OH&S, EUB, and WCB regulations with established worksite rules and procedures and work safely with equal concerns for the safety of all workers. All contractors, including management and supervisors, are responsible and accountable for the Company’s overall safety initiatives, following all procedures, working safely and providing information towards the improvement of safety measures. Complete and active participation by everyone, every day, in every job is necessary to achieve the safety excellence CYA Rentals Ltd. expects. A workplace free of injuries and / or accidents is our goal. Through continuous safety and loss control efforts, we can accomplish this together.